Our staff are dedicated, yet fun loving professionals and are continually striving to excel in their field. We firmly believe that your scuba diving excursion is only as good as the people who work to ensure you have a safe and wonderful experience. We are always looking for new ways to improve our skills and service, to better serve you. Ours is a never ending commitment to provide you with the most memorable scuba diving that Grenada has to offer, and safety is our guide. Diving is my passion & it is my pleasure to guide & show you the underwater treasures of my homeland Grenada. It gives me great satisfaction to teach people and see them so happy & excited after having successfully completed their 1st dive.I have been diving in Grenada's waters for over 30 years and gained a good knowledge about all the dive sites and currents.Let me share my experience with you, let me teach you to dive or improve your diving skills, and most of all, let's have fun ! In September 2016, I joined the Native Spirit Scuba team. I feel eager to learn to scuba dive and learn all the other watersports skills like snorkeling, Hobie cat sailing, boat driving etc. I’m originally from Carriacou, Grenada’s sister isle. I lived close to ‘Paradise Beach’ where I learned to swim and also enjoyed going fishing. I am a very kind person, love meeting people and love to interact with others. 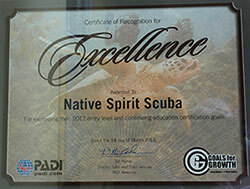 I’m a part time worker at Native Spirit Scuba, working there mainly on weekends. I love driving the dive boats and also guide the snorkeling trips. I started as a part time worker at Native Spirit Scuba, having helped out mainly on week-ends and during school holidays. Since October 2012 have become a full time worker at the company, currently holding the status of ‘Dive Master’, DM # 371411. I love the beach and also what I do: sailing, snorkeling, scuba diving and driving boats. I'm a very warm hearted person, kind to others and make them feel welcome. I'm also a watersports instructor and enjoy teaching people. I love meeting new people and I'm always happy to see repeaters. I look forward to holding hands of the frighten ones and like to see them leaving our dive center with a joyful smile! Hi, i'm Adrian's wife Rahel, the dive center's Office Manager. I’m probably the first person you get in touch with either through e-mail or walking into our dive center looking to get information about our services offered... Since i was small, i loved being in the water. I actually learned to swim in the Caribbean Sea while on holiday with my parents, when i was 5 years old. I have always enjoyed snorkeling and Adrian has introduced me to Scuba Diving. I'm originally from Switzerland and my native language is German. I can also speak a little French, and after having lived in Grenada for many years (since March 1996 ! ), have adopted quite a lot of 'Grenadian' English. 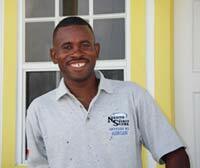 I love meeting people and have been involved in the Tourism industry ever since i moved to Grenada. I gained a lot of valuable experience when i worked as a representative for German and Swiss Tour Operators and as a tour guide, at Sunsation Tours. Should you need any advice about what else there is to do and see in Grenada, besides diving and watersports, i will be more than happy to assist you. Since 2000, Adrian and i are the proud parents of identical twin boys, who are already like two fish in the sea, and will probably soon follow in daddy's footsteps. In march 2010 I joined the Native Spirit Scuba "family" as a boat driver and have since gained a lot of knowledge about boat handling/repairing. 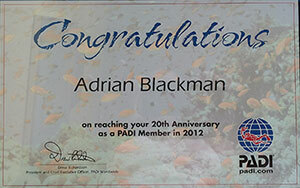 I improved my watersports skills, learnt to scuba dive and moved all the way up to the level of Dive Master, DM # 371412. I love to interact with people from all over the world and making sure they are having a good time! "Juliette" and "Schatzi" are both Starmas built 290 Tarpon. We recently upgraded and replaced our 2 stroke engines on both boats with 4-stroke Yamaha engines ( 2 x 250 HP ) on each boat. These engines are more economic and environmentally friendly. They can both accommodate 16 divers or 22 snorkelers each. Both boats are well equipped with all necessary safety equipment, such as life jackets, life ring, emergency oxygen, fire extinguishers, signal flares, VHF radio, GPS, first aid kit." Schatzi" is additionally equipped with a radar and a depth sounder. For your well-being on board, both boats offer the luxury of a fresh water shower and a Marine Head ( toilet).